Asian Americans, Native Hawaiians and other Pacific Islanders (AA&NHPIs) are among the fastest growing racial/ethnic groups in the United States. AA&NHPIs are highly diverse in their culture, language, and health needs, representing more than 50 ethnic groups and 100 languages. In 2017, nearly 1.2 million AA&NHPIs received care at a community health center. States that experienced new growth in the number of AA&NHPI health center patients include Arizona, Colorado, Connecticut, Florida, Nevada, and Texas. Health centers provide high quality, culturally and linguistically appropriate comprehensive primary care to these and other medically underserved communities, regardless of insurance status or ability to pay. Because of their multi-disciplinary approach to care, health centers effectively address both clinical and non-clinical health and social risk factors, and play a major role in addressing racial and ethnic health disparities. 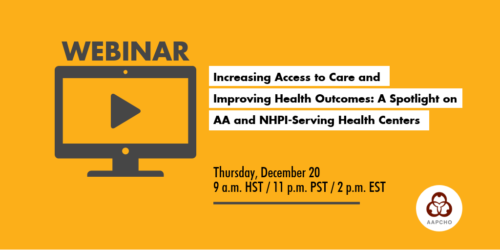 Join us for a live webinar to learn more about the role of health centers in increasing access to care and improving health outcomes for medically underserved AA&NHPIs. Presenters will share key findings from AAPCHO’s new and soon-to-be released fact sheet entitled, “The Health of Asian Americans, Native Hawaiians and Pacific Islanders Served at Health Centers: UDS 2017”. Patient demographics, health utilization and patient health outcomes at AA&NHPI-serving health centers. Key differences between AA&NHPI-serving health centers and other community health centers across the country.